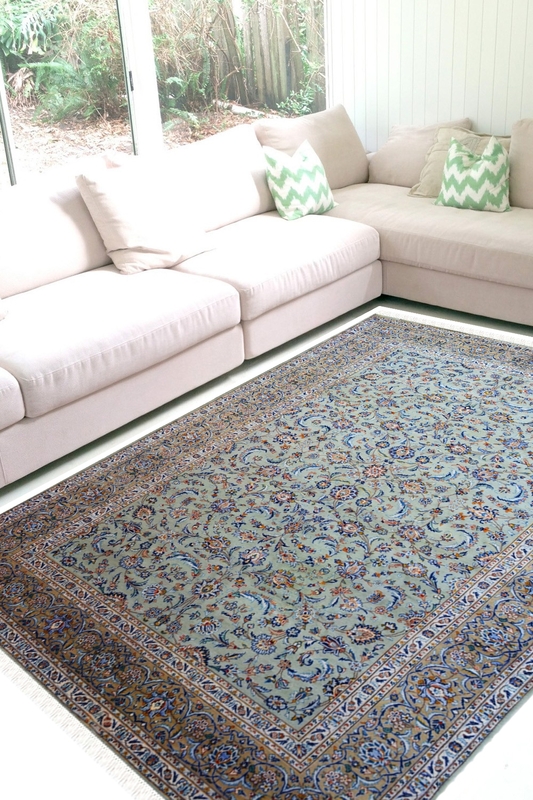 Buy Carpets for living room and Kashan Neel Pooran wool area rugs and carpet online in low price. Serene and beautifully handmade in New Zealand wool. All over floral Kashan design pattern inspired by Persian motifs. One of a kind and perfect for a space with subtle interiors. It is a pure Persian woolen carpet. Beautifully hand woven in the finest quality New Zealand wool with a beautiful design pattern. The design is Kashan and has originated from a province in Persia called Kashan. This rug has an all-over floral pattern throughout the rug. The main colors are sea green and gray. The border has tiny floral motifs woven in unison. This type of rug should be used as a feature rug in a space with subtle interiors or neutral tones. Due to its fine quality and superior craftsmanship, this rug is highly durable and can be passed on from generations and generations to come all together.